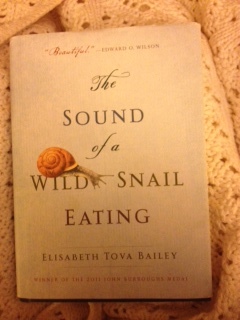 Rabbinic Pastor De Fischler Herman, Mashpi’ah Ruchanit, reviews the book, The Sound of a Wild Snail Eating by Elisabeth Tova Bailey, in the Fall 2012 edition of the Journal of Research Administration. [JRA is published twice a year by the Society of Research Administrators and addresses the arts, sciences and technologies associated with research leadership, administration, management and support. ] Elisabeth Tova Bailey has been suffering from an unnamed autoimmune disease for 20 years. The very act of having a telephone conversation requires her to lie flat in her bed and still depletes her energy. Through sheer will and a gift for narrative, she has written and published The Sound of a Wild Snail Eating, a beautiful book that simultaneously connects the reader with the natural world, the science of mollusks, and the world of one confined to her bed.